As temperatures dwindle during winter, so does everyone’s enthusiasm for the season. To choose between being a shut-in for months on end or a popsicle as soon as you walk out the door is a difficult decision for anyone to make, and could ultimately lead to deeper psychological problems. 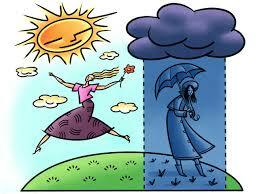 Seasonal affective disorder, appropriately acronymed SAD, is a type of depression that accompanies a change in season. In the Midwest, SAD is most prevalent with the onset of the winter season, but has been known to cause depression, much less frequently, in the spring or early summer. Approximately one-half million of the U.S. population suffers from winter SAD, and three-quarters of the sufferers are women. The onset typically is early adulthood but SAD can also occur in children and adolescents. Older adults are less likely to experience SAD. This illness is more commonly seen in people who live in cloudy regions, making Ohio’s gray skies a breeding ground for SAD. After reading that list you are probably thinking that most of the people in your life, including yourself may have seasonal affective disorder, but this is not the case. It is normal to have days that you feel down in the dumps, but when these feelings last for days on end and you no longer have the motivation to do things you once enjoyed, then it is time to see a doctor. This is especially important if your sleep patterns and appetite have changed or if you feel hopeless, think about suicide, or turn to alcohol for comfort or relaxation. take Vitamin D supplements as your doctors orders. Too much Vitamin D can have an adverse affect on your body. Doctors often refer to Vitamin D as the “sunshine vitamin” as it will provide you with the same vitamin you get from the suns rays. It can be taken when sunlight is limited as it so often is during the winter. Light therapy is also an effective way to get your prescribed dose of Vitamin D. Experts suggest that increased exposure to full-spectrum light can help alleviate many of the effects of seasonal depression. Many physicians recommend a minimum of 20 to 30 minutes of light exposure each day with a minimum light intensity of 10,000 Lux in order to sway symptoms of seasonal depression. Light therapy is a safe method of treating SAD, and patients usually reach full benefits within two to four weeks of starting treatment. While the winter months continue, remember to be wary of lurking SAD and seek professional help if you think you may have the disorder. We all just have to take it one winter at a time!